Quickly whip up deliciously cheesy pizzas and other warm snack foods with the Avantco CPO-12 countertop pizza / snack oven! Constructed of durable stainless steel, this 1450W oven is wide enough to hold up to a 12" pizza. Its 2 1/2" tall opening makes it easy to load pizzas and other snacks on the handled wire rack, and a built-in 30 minute timer lets you know when your treats are heated to perfection. We bought two of these for late night pizza at our bar, and they got the job done. Highly recommend warming it up before putting in pizza or other food. Used this oven to reheat pizza for a fundraiser. Was able to fit 2 huge slices at a time. Within 2-3 minutes we had piping hot ooooowey gooowey pizza. A hit! This item is fast and efficient. I rely on this oven daily when it comes to creating beautiful food creations for my customers. I am never disappointed. These ovens are working out great. No special wiring was needed, they are simple to use and it cooks pizza perfectly everytime! I would recommend them. This pizza oven is working great. Very affordable option to make frozen pizza's in minutes. The stainless steel look is modern and compact enough to fit in a tight place. love, Love Love my little Pizza oven. You cannot go wrong with this item. Great price ! Great product. Exceeded my expectations! Does NOT take up much space at all !!! This snack oven / pizza oven is great for employee meals if nothing else! We sell premade pizzas in our market, and this pizza oven crisps St Louis style pizzas up perfectly! Added this countertop oven for selling slices of pizza. For the price it is hard to beat, but it does take a little longer to cook compared to a more expensive unit. This oven is a convenient way to heat up sandwiches and breads in a quick way. The adjustable dial makes it easy to customize cook time. Also,the size doesn't take up too much space on the counter. These ovens are ok. They work for awhile and they simply give up. In the pizza oven category these are priced right, but they don’t last very long. We use these in our brew pub to heat up frozen pizzas. They take 20-25 minutes to cook a pizza, which is a bit long. I would be ok with the time if they were more reliable. Sadly there is no other good option in this price range. Works perfectly fine. A good and reliable machine to heat up pizzas and any snacks. Would recommend to any small time business owner or cafe owner. Bought four of these snack pizza ovens and they work great for the quick service we need. The size is perfect too. All four ovens fit on our countertops perfectly. We have a couple of these. One works fine, the other has flaky temperature settings. If you just occasionally cook pizzas and can watch them, these are ok. We eventually quit using them and bought a real pizza oven (https://www.webstaurantstore.com/nemco-6205-countertop-pizza-oven-120v-1800w/5916205.html) which is the way to go if you do much pizza sales. Super cute little guy. We only used it for a while as it wouldn't keep up with the demand we ended up having. But for the time we used it, it kept up really well! We kept it incase we need a back-up, and its easy to store. Yes.. you get what you pay for. this is a very cheaply made pizza oven. It doesn't cook evenly.. we own a bar /restaurant and we have a 12 year old countertop pizza oven that cooks our pizza better than this one.. spend the extra money and get a good one! We bought this to replace an older style, different brand of pizza oven. Was a little leery to try this brand in the pizza oven, but have used it a few times on pizzas and does a great job. Even baking and no complaints. Good for low volume. Sheet metal is fairly thin and has a lot of heat loss, but for the price it is a good piece. I suppose you get what you pay for. At first this product worked well. After only a few months of light-to-moderate use, it now takes double the time to cook pizzas. We now use a toaster oven to cook pizzas, as it does a better job. Not recommended if you want a high-quality machine that will cook quickly and last for years. Simply Amazing the brand that we trust! Avantco CPO-12 Countertop Pizza Snack Oven - 120V, 1450W works perfect for pizzas and other snacks. We will be placing orders for more soon these are great! This is a great oven for cooking pizza snacks short order warming and I have found it useful in my concessions stand recommend highly great buy! Nice looking product, great price point and nicely constructed. My only complaint is that it takes longer to heat up than my other ovens and cooks more slowly. Overall, just ok.
Great Product, we use it after the kitchen closes to cook our own frozen pizzas. Late night pizza orders have been a nice addition to our business. This Snack Oven is great not just for pizza, we like the fact that it is countertop and electric, so we don't have to worry about any special installations, just hook it up anywhere and you are good to go! Great for fairs and other outdoor events. This was a steal in my opinion, It is used in my concession trailer and it works like a charm. The price was to die for. I purchased 3 and have no regrets. 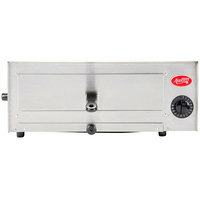 The Avantco CPO-12 Countertop Pizza Snack Oven has been a great addition to our shop. It works well and doesnt take up a lot of room. This counter top pizza and snack oven has worked perfectly, and I look forward to using it for a long time. It needs a good bit of counter space, but it is worth it for the convenience this machine provides. This works well for cooking flatbreads or small appetizers in small batches. Takes a while to reach maximum temp, but holds heat well once preheated. Easy to clean, lightweight, easy to transport for off site events. Awesome little oven! Great price also. This is perfect for so many of our lunch specials. It's compact and easy to store as space is limited. Love it! Great pizza oven... got it while it was on sale for $50. Very easy to use just set the timer put in the pizza and done! This little oven is a winner, heats up super fast and consistently delivers great results, I actually threw out a toaster oven and replaced it with this one, I plan to get a couple more for the game room and another for my daughter. It's a great price too. The Avantco CPO-12 Countertop Pizza Snack Oven – 120V is an ingenious creation that I had to have and it's a really good look. Thanks, Webstaurant. EXCELLENT oven. It heats up super fast and gets to 450 fast. It cooks our pizza's completely in about 10 minutes. It works best when not warmed up, just put in the pie and turn it on. It's a nice compact pizza oven that can used at any bar or restaurant. You need to have some space around the area that it is used in because of the venting. It is super affordable though. It is easy to use. Not optimal if you have high volume..